Casio Exilim Zoom EX-Z750 digital camera features 7.2 megapixel CCD, 2.5-inch TFT color LCD display, fast and auto switching between focus and macro mode, movie best shot selection, fast response with 0.007 second shutter delay, manual aperture and shutter speed settings, high quality MPEG-4 movies capture, 3x optical zoom, USB docking station for various additional functions, and ability to save the best pictures as personal favorites on the internal memory of the camera. All these wonderful features come in the luxury silver metal case. PC Magazine reviews Casio Exilim EX-Z750 and concludes with rating of 3.5 out of 5 that the Casio EX-Z750 is an easy-to-use, well-made ultracompact, with only a few drawbacks in picture quality. Despite some minor issues with image quality, the Casio Exilim EX-Z750 is a good choice for a multipurpose ultracompact. For cameras around the same price, though, PC Magazine still prefer the Canon PowerShot SD500 Digital Elph, for its superior photos and slightly quicker recycle time. 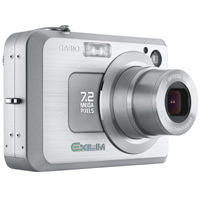 For more features, specifications and sample images of Casio Exilim EX-Z750, visit Casio homepage.